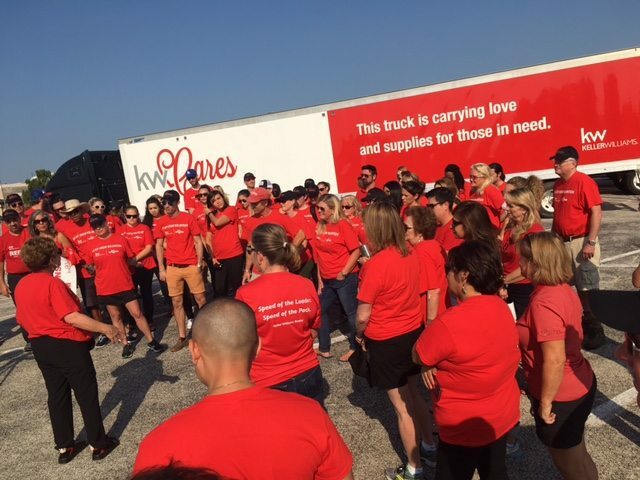 Keller Williams’ charity arm, KW Cares, was finally able to send in its three 18-wheeler trucks from Austin, Texas, to a waiting warehouse in Houston at 10:30 a.m. CDT, Friday. The trucks had volunteers aboard ready to work on unloading the trucks at the other end. Keller Wiliams spokesperson Darryl Frost said the company was expecting 700 to 1,000 volunteers to be working over Labor Day weekend. The address of the Houston warehouse is only known to Keller Williams associates and leaders at this stage as KW Cares is a charity for Keller Williams associates primarily. Mary Tennant, board member and past president of Keller Williams, spoke with the volunteer teams from Austin prior to the convoy leaving this morning. The flooded roadways of Houston made the small fleet unable to enter the city until today. With 16 market centers and 4,400 associates in Harvey’s footprint, Keller Williams had lined up three warehouses to help with the aftermath — one in San Antonio, one in Corpus Christi and one in the dryer part of Houston. But because of the way the storm has developed, Houston is the command center. Other large real estate brokerages gave their responses this week to the disaster. Realogy originally pledged to match up to $50,000 for Red Cross Hurricane Harvey relief for funds raised via the Realogy Charitable Foundation. After passing that goal, the company increased its total match to $75,000. Re/Max, which had more than 2,600 Re/Max associates in over 110 offices in the Texas Gulf Coast directly impacted by the storm, was working to ensure its agents and their families’ needs were met swiftly, the company said Tuesday. “We’re creating an online hub with information and resources for anyone affected including help and support from surrounding Re/Max offices,” said Adam Contos, co-CEO at Re/Max. 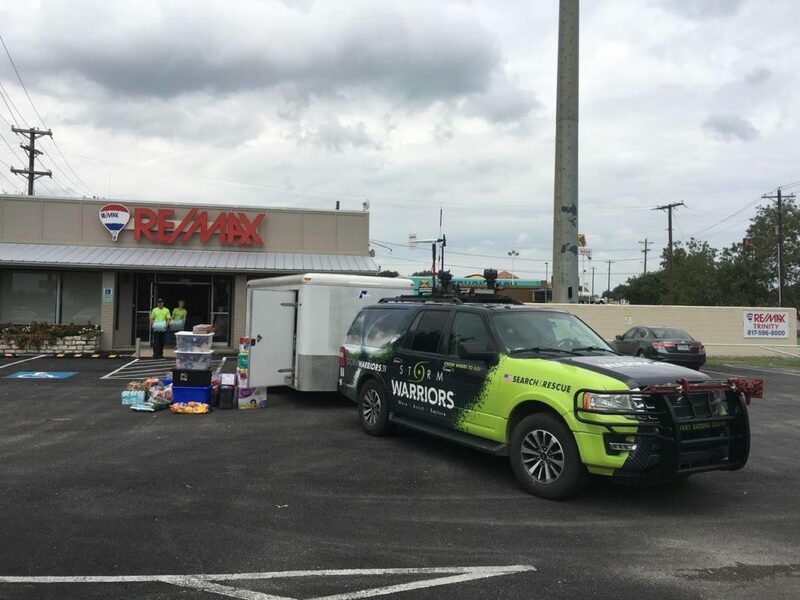 A number of Re/Max offices and agents have collected supplies to be delivered to Re/Max Trinity in Weatherford, Texas, the company said Wednesday. Mike Casey of Re/Max Trinity is working with an elite disaster response team called Storm Warriors to stock 18-wheelers full of food and goods and has been driving them down to people in accessible disaster areas. Exit Realty Corp.International was another large real estate player to step up last week, announcing August 30 that it would donate a total of $300,000 to the hardest hit in Hurricane Harvey. A portion of every transaction fee received by EXIT Realty is pledged to a non-profit organization of choice. A donation of $200,000 from that pledged pool of funds to Habitat for Humanity will be directed to benefit flood victims. The company has, meanwhile, donated a further $100,000 to the Red Cross disaster relief efforts. The National Association of Realtors is working directly with the Texas Association of Realtors to determine how best to support its needs with grant funds from the Realtor Relief Foundation and 100 percent of donated funds made available to members and consumers to assist with housing-related needs. As of Tuesday morning last week, Keller Williams had confirmed 312 KW agents whose houses have been damaged by the hurricane to some degree, said Frost, who expects this to rise. Leadership had made sure to touch based with each of the affected 4,400 associates this week, he added. “Due to large amounts of flooding and destruction, KW Cares estimates that we will need to raise millions to aid those affected,” the company said, directing those able to assist to kwrelief.org to contribute monetary donations and indicate that it’s for Hurricane Harvey. Executive Director of KW Cares, Kathy Neu, was heartened by stories of KW agents going beyond the call of duty in flood-stricken Houston.